When election fatigue starts to set in, I consider myself fortunate to be surrounded by third graders. Eight year olds tend to approach this event, as they approach so many parts of their day, with a charming mixture of curiosity and vagueness as to exact details (there have been several grave conversations between children about whether someone named “Romney … or maybe Rombly” will “get a turn” to be president next). There are many wonderful picture books about elections, politics, and presidents, but two of my favorites use characters that many children know from other books. Both of these books stand on their own, but children who are familiar with the characters will enjoy seeing these old friends in a new light on the campaign trail. Duck for President (written by Doreen Cronin, illustrations by Betsy Lewin) continues the story of the farm first introduced in the Caldecott Honor book Click, Clack, Moo: Cows That Type. Duck is tired of his chores on the farm, and decides it’s time to move up in the world. He runs for the job of farmer (much to the surprise of the Farmer, who didn’t know it was up for election) and wins. Unfortunately, that job has its own problems, so Duck continues to seek out higher and higher office. Children love the expressive illustrations and the details of each messy job. There’s plenty of new political concepts to introduce to readers as Duck ascends the ladder of elected positions, and the growing size of the numbers (up to millions in the presidential elections) in each electoral tally will tickle the mathematically inclined. Adults may be more entertained by the constant recounts and the unusual places that missing ballots are found. They may also recognize references to iconic presidential images in some of the hilarious illustrations. There is a lesson for readers here – something about appreciating your own role and realizing that each job comes with its own headaches – but that lesson is saved from being heavy-handed by a funny twist at the end. 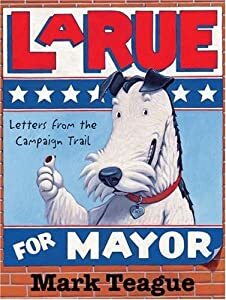 LaRue for Mayor: Letters from the Campaign Trail (written and illustrated by Mark Teague) features one of my third graders’ very favorite literary dogs, Ike LaRue. Ike first appeared in the clever picture book Dear Mrs. LaRue, and this book uses the same strategy as that one of telling the story through Ike’s letters to his owner and articles from the local paper. Ike writes to his owner while she is recovering in the hospital to tell her about his “social club” of dogs, dedicated to “good deeds.” The rowdy dogs (who are actually spending most of their time knocking over hot dog carts and disrupting baseball games) come to the attention of mayoral candidate Hugo Bugwort, who decides to run on a harsh “anti-dog” platform. Naturally, Ike has to enter the race against him, engaging in some good old-fashioned smear tactics. In the end, Bugwort sees the error of his ways and a bipartisan (human and dog, of course) coalition is created. This book is a nice introduction to the shaking-hands-and-kissing-babies nature of local politics. However, like the other Ike LaRue books, it also has another lesson for children in the idea of perspective. Ike writes to his owner in glowing terms about his own innocent activities, and his dramatic voice is one of the reasons this is such a delightful read aloud. Teague’s illustrations are done in a split screen fashion: Ike’s version of the story is illustrated in black and white, while the messier reality of the situation is illustrated in color on the same page. Children love picking up on the exaggerations of this unreliable first-person narrator, and they hone in quickly on the differences between Ike’s words and the color illustrations. This method of storytelling and shifting perspective could lead to a particularly interesting conversation with older children about the ways that political parties use perspective in their ads and speeches. 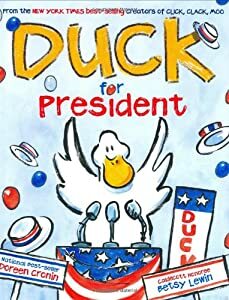 As you find yourself wading through the piles of election themed books this season, I highly recommend Ike and Duck as humorous incumbents that your child can get behind. Happy reading!